Ames. Smithsonian neg. no. 69,029. At the beginning of his career as an investigator of electromagnetism, in the fall of 1827, Joseph Henry took up a simple idea, and soon found that it led him to some remarkable results. He was starting his second academic year as Professor of Mathematics and Natural Philosophy at the Albany Academy, a school for boys in Albany, New York, offering instruction extending from what we would now call elementary grades up to and overlapping with the college level.1 Henry took his teaching responsibilities seriously, but he also had an ambition to make original scientific contributions. 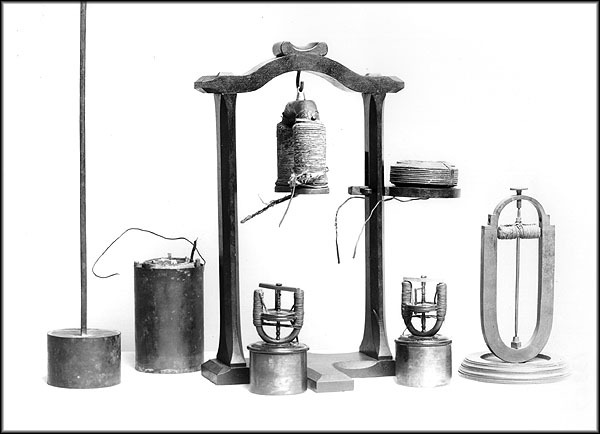 Henry began by pointing out that the introduction of electromagnetism as a subject of instruction had been hampered because of the expense and awkwardness of the large batteries and delicate apparatus needed to show the effects. Recently, however, the English experimenter William Sturgeon had eliminated much of the difficulty by showing that the use of strong permanent magnets allowed many of the experiments to be done on a larger scale, and with a smaller battery, than was previously thought possible. But some electromagnetic experiments depend on the earth's magnetic field, or the interaction between two current-carrying wires. For these experiments permanent magnets could not be used, and the difficulties remained. 1821), Plate I (after p. 114), Fig. 10. Here is where Henry made his first contribution. He had read that Johann S. C. Schweigger, professor of chemistry at the University of Halle, had invented what came to be called a "galvanic multiplier" for augmenting the deflecting action of an electric current on a compass needle. This effect (the first discovery linking electricity with magnetism) had been announced in 1820 by Hans C. Oersted. 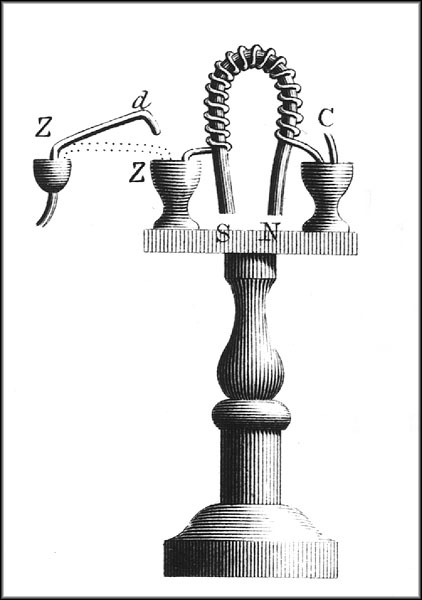 Oersted used in his experiments a single straight wire passing close to the compass; Schweigger, a few months later, showed that if the wire was formed into a vertical coil of several turns around the compass, the effect would be greatly increased.3 Henry, in turn, now described in his 1827 paper how Schweigger's coil idea could be applied to other standard electromagnetic demonstration devices to make them more sensitive or powerful. Henry's versions of these devices embodied no new discovery, but were simply more dramatic and effective as educational aids. 43 (1824), Plate 3, Fig. 13. His next step was to apply the coil principle "to a developement of magnetism in soft iron, much more extensively, than to my knowledge had been previously effected by a small galvanic element." He did this by winding an electromagnet with about 400 tight turns of a wire 35 feet long, "instead of loosely coiling around it a few feet of wire, as is usually described. "4 This is probably an indirect reference to the electromagnet described by Sturgeon, who is generally credited with its invention. 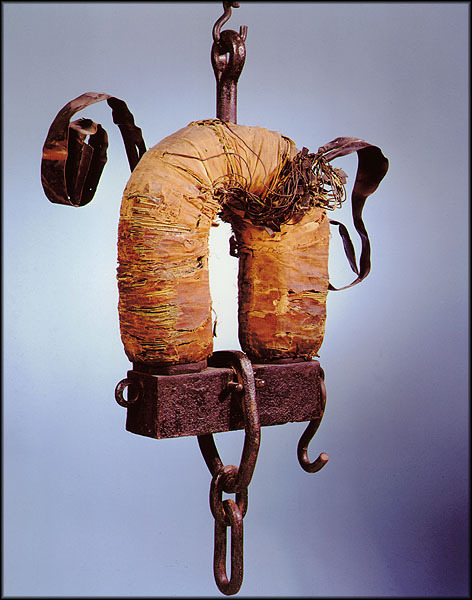 Sturgeon used uninsulated wire (insulated wire for electrical use was not then commercially available); to prevent short-circuiting of the windings, he varnished the iron core and separated the turns of wire to keep them from touching. 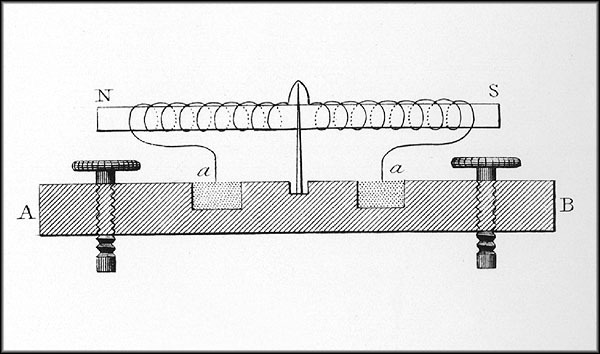 The illustration of his magnet, in fact, shows only 18 loose turns.5 Henry insulated the wire itself with silk thread and so could apply a large number of tight turns. from old photograph, N.M.A.H. Cat. No. 181,451c. Smithsonian neg. no. 39,040. So far, he had not done anything really new, but just extended and combined known principles using simple techniques. He now saw, however, a new line of investigation opening before him: the determination of the principles for designing powerful, efficient electromagnets, which would develop the greatest possible lifting force with a given small battery. Systematically he explored different methods of winding, using various lengths of wire in various arrangements and trying increasingly large iron cores. 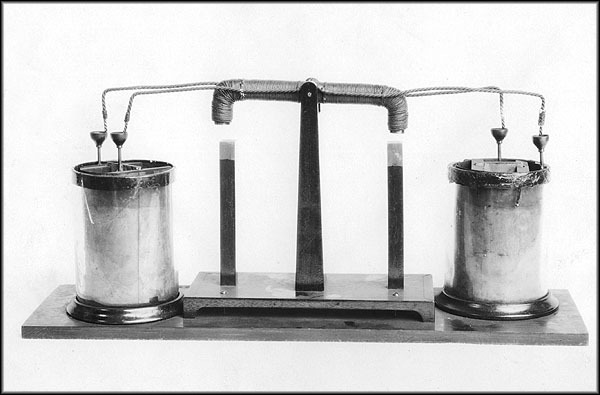 From these experiments Henry discovered that if a cell of a single pair of electrodes is to be used with a given magnet, the magnet should be wound with several coils of wire in parallel; on the other hand, if a battery of many cells is to be used, the magnet winding should form a single long wire. Henry was the first person to understand this idea. It later became a fundamental basis for much of electrical technology, and, in particular, made Samuel F. B. Morse's telegraph feasible. 408. Smithsonian neg. no. 46,797-F.
direction. N.M.A.H. Cat. No. 181,343.
to the battery. N.M.A.H. Cat. No. 181,343. Smithsonian neg. no. 74-4407. Journal of Science 20 (July 1831): 342. In the summer of 1831 Henry described the first of these applications in a short paper, "On a Reciprocating Motion Produced by Magnetic Attraction and Repulsion. 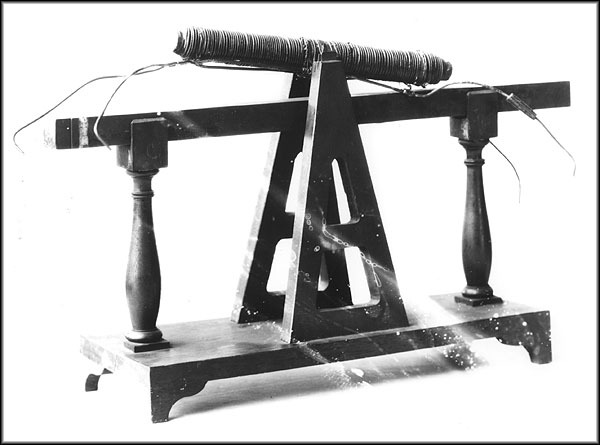 "11 It was a simple device whose moving part was a straight electromagnet rocking on a horizontal axis. Its polarity was reversed automatically by its motion as two pairs of wires projecting from its ends made connections alternately with two electrochemical cells. Two vertical permanent magnets alternately attracted and repelled the ends of the electromagnet, making it rock back and forth at 75 vibrations per minute. 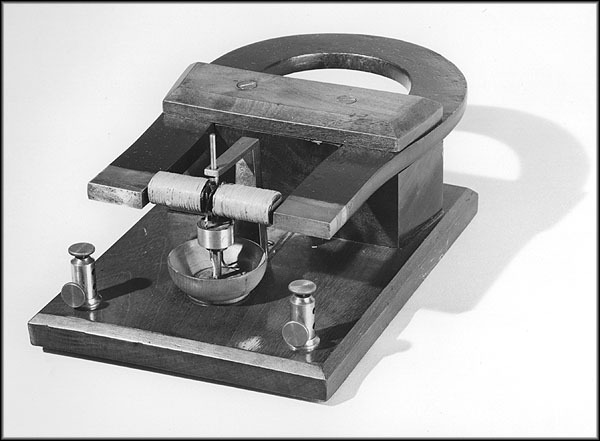 Henry at this time considered his little machine merely a "philosophical toy," but nevertheless believed it was important as the first demonstration of continuous motion produced by magnetic attraction and repulsion. Furthermore, "in the progress of discovery and invention, it is not impossible that the same principle, or some modification of it on a more extended scale, may hereafter be applied to some useful purpose." Indeed, one authority has stated, "Henry's apparatus was the first clear-cut instance of a motor capable of further mechanical development. It had the essentials of a modern DC motor: a magnet to provide the field, an electromagnet as armature, and a commutator to apply the mechanical forces at the right time. "12 Other inventors did later develop motors of various designs based on similar reciprocating actions, but it is not clear whether these inventors knew of Henry's device, or created theirs independently. In any case, reciprocating motors never became commercially successful; continuous rotary motion proved to be a more efficient and useful principle. In 1831 the future development and importance of what we now call the electric motor could scarcely be foreseen. Henry at that time was striving to build a solid reputation as an original scientist while conscientiously discharging his teaching responsibilities at the Albany Academy. At the start of his career, a few years before, his research interests had been dominated by a desire to develop effective, compelling demonstration apparatus for his classes. His 1827 paper on extending the "galvanic multiplier" principle, discussed above, exemplifies this motivation. Large equipment and dramatic experimental effects, he knew from experience, attract the attention and hold the interest of students. Certainly some of the original motivation for the construction of his powerful electromagnets can also be ascribed to this desire. But the process of developing those magnets led Henry to make a real discovery, and this, along with the magnets themselves, was beginning to make his name known in scientific circles. 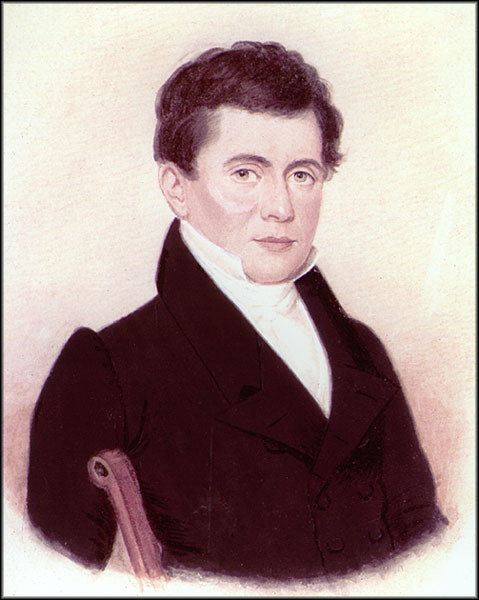 In November 1832, a year after his letter to Cleaveland, Henry moved from Albany to the college at Princeton, New Jersey, where he continued conducting experimental researches whenever he could find time away from his teaching duties. 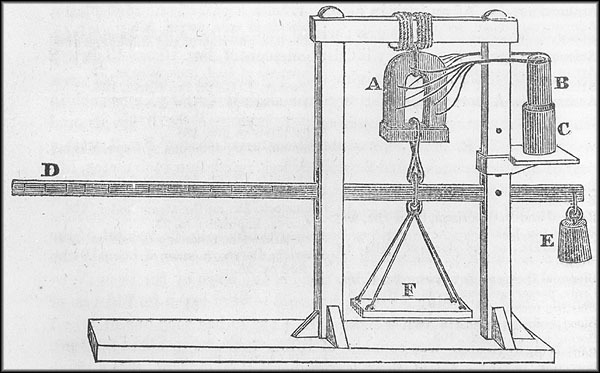 In 1834, he lent the machine (apparently in its original configuration) to another colleague, Jacob Green of Philadelphia, who wanted to use it in a popular lecture. In their correspondence about this loan, both men called the device the "sheep's tail," presumably referring to the wagging motion of the projecting wires.14 The familiar use of such a nickname suggests that Green and Henry had discussed the machine at some length. In his letter to Green, Henry remarked that he was constructing a new version "on a some what different plan" using C-shaped magnets in place of straight ones. This promised to give "a moving force double of that in the other plan." He also said, "Many different forms of the instrument have suggested themselves to my mind." It is clear that the device had become more than a mere "philosophical toy" in Henry's imagination. 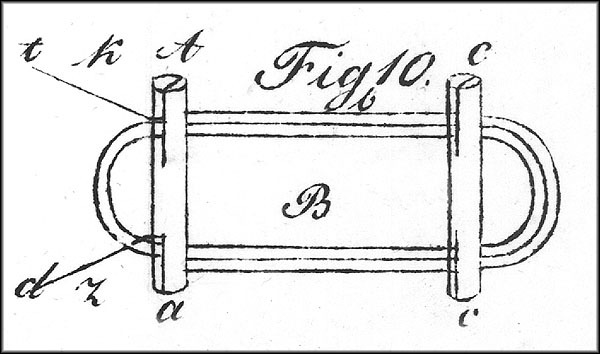 Concrete evidence of this continuing interest is a machine long preserved in the Princeton apparatus collection.15 In its general form it is similar to Henry's 1831 invention, but it differs in having, instead of the two vertical bar magnets under the rocking electromagnet, a single horizontal bar magnet. With this configuration, the ends of the electromagnet are acted on by two different magnetic poles, north and south; in the original device both were north poles. In consequence of this change, an ordinary electromagnet would not oscillate--both ends would be attracted or repelled at the same time. 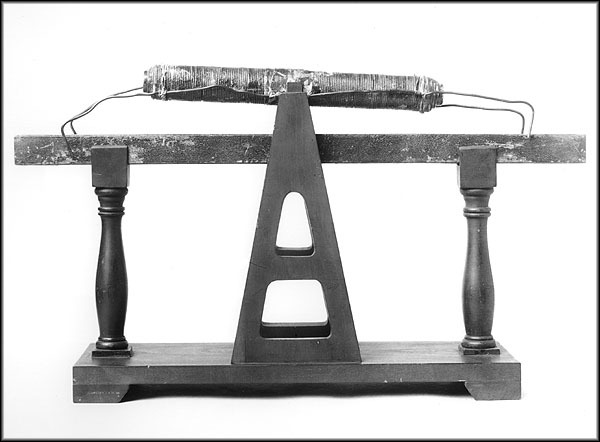 An apparently accurate replica of the Princeton device made for the Smithsonian suggests that Henry accordingly wound the electromagnet in opposite directions on its two ends--in effect, creating two electromagnets end to end, with like poles together at the middle. No written record of this development appears to survive; it is known to us only through the three-dimensional evidence of the demonstration device. Fig. 2. Smithsonian neg. no. 45,393-H. 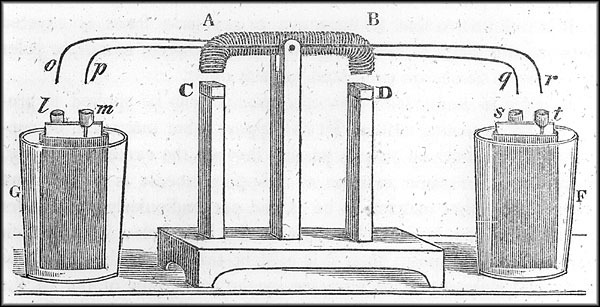 In 1833, not long after Henry invented his oscillating electromagnet, William Ritchie, a clergyman, educator, and experimentalist in England, contrived a way to make an electromagnet revolve continuously. He caused its polarity to reverse twice in each revolution by an arrangement of wires grazing across two semicircular troughs of mercury.16 It is unlikely that Ritchie had heard of Henry's invention; he probably devised his scheme independently. Nevertheless, when Henry heard of it, he suspected that Ritchie had "lately reinvented my machine," implying that he had neglected to give Henry due credit for the idea. mercury commutator. N.M.A.H. Cat. No. 315,532. Smithsonian neg. no. 47,797-C.
His touchiness in this matter is an example of a characteristic he displayed at other times in his career. The most notable instance was his dispute with Samuel Morse about his contributions to the electromagnetic telegraph. Like his remarks in that dispute, Henry's expressions of concern about the credit due him for his motor reveal his strongly held beliefs about the value of his contributions and the importance of scrupulous fairness in scholarly publications. It is clear that all along Henry believed that much of the honor belonged neither to Ritchie nor to Page, but to himself. Yet whatever Henry may have felt about the lack of recognition for his contribution to the Revolving Electro-Magnet, Davis's commercial version of it was just the kind of impressive demonstration device that he liked to put into action for his classes and lectures. And indeed an example survives at the Smithsonian among a collection of apparatus said to have once belonged to Henry. The date he acquired it is unknown. 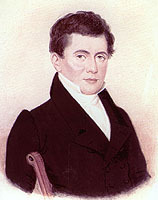 It agrees closely with Daniel Davis's illustration in his catalogues of 1842 and 1848, however, and may have been made by Davis about that time. It is impossible to be certain, however, because the device is not signed, and other makers copied Davis's handsome designs. Here in one instrument, then, are embodied the contributions of several electrical investigators. 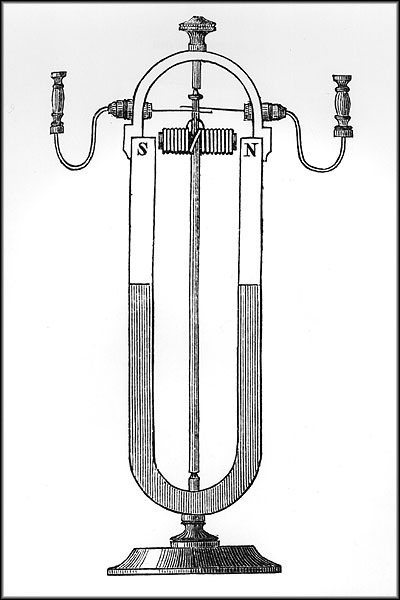 With regard to Henry, Ritchie, and Page, perhaps it would do justice to all three to say that Henry was the first to show how polarity could be automatically reversed and Ritchie the first to produce rotary motion of an electromagnet, while Page introduced into Ritchie's device the simple and effective "pole-changer," which remains in use today.